oder z.B. 36 Raten à 138,33 € mit der 0% Finanzierung! 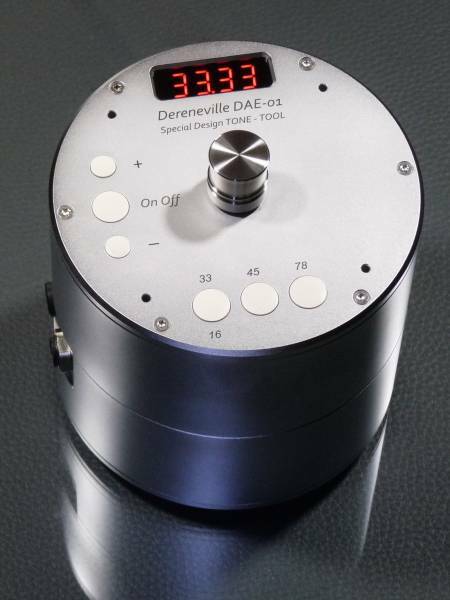 The Dereneville DAE-01 by AVDesignHaus offers a unique perspective and user flexibility in turntable motor units. All operational parameters can be set by manually using the push buttons on top of the drive unit. Additionally for convenience, the parameters can also be programmed via computer, with the aid of our specially developed software. The housing of this drive unit, made from high grade Aluminium, is specially designed for the Papst-Synchronous motor VDC-3-43.10 937 4310 602 which allows for a vibration free and low noise operation, thanks to the flexible mounting of the motor itself inside the housing. The complete electronic control unit is safe and EMV tested and is integrated in the housing. The integrated display shows every status and each step during programming by the buttons on top. The brightness value is user adjustable as is the delay time for illumination decay. This new developed drive unit offers three speeds: 33,33 rpm / 45,00 rpm / 78,00 rpm and one hidden speed: 16,66 rpm and a pitch control over a very wide range whilst the turntable is running. This hidden speed of 16,66 rpm offers two advantages: firstly, you can play the old records cut by 16,66; secondly, it lowers the platter to half speed in order to change the record more safely whilst running. By pushing the 33,33 knob once, the speed goes down to 16,66 - and by pushing it again, it will speed up to 33,33 rpm. All speeds can be calibrated with exacting precision in very small steps 1,0 / 0,1 / 0,01 or 0,001 Once the speeds are calibrated, they can be stored in the memory of the electronic board. This is possible for every set. Usually you only have to adjust the main speed 33,33 rpm. The electronic control unit inside calculates all other speeds exactly. Of course you can check them and calibrate them individually. The main memory is fragmented in three segments, called: set 1 / set 2 / set 3. This means, that you can illustrate three different, virtual drive units in just one. For example, if you have up to three turntables, then you can use only this one drive unit to play them perfectly, each at a time. Just place the drive unit to that turntable you want to play and recall the set for this turntable. The hours of operating of the three sets will be counted separately, together with the total hours of drive play. Each Set has its own operation hour control and supports the belt and up to three needles. In practice: if you have two or three tone arms mounted at your turntable, all with different cartridges, you can assign them to (nd: needle) nd 1, nd 2 and nd 3. This means, that you can monitor operational duration of a single or multiple cartridges, every time you want. This is a useful application to determine stylus degradation over time. You can, for example, program a user-defined time period for oiling the bearing of the turntable. This drive unit will store this and implement it for you. And you will get the exact time to change the belt or string in the preselected time. Different turntables have different platter weights. Our drive unit offers the best possible approach to generate the perfect time for accelerating and decelerating. This preserves the belt or the string from damage. All values can be programmed separately in each set and they can be stored in the main memory of the electronic unit and also on your computer. This unique feature, along with the other applications, are suitable to programming via computer. The connection has to be made via USB-II cable. Our -motion animation- means you can program any number of individual times from 1 hour up to 7 days to run the turntable, for example 1 minute or more, at a lower speed. This ensures that the oil in the platter bearing will be evenly shared and the belt or string will find another position, preventing damage to the turntable and belt. This drive unit has an input for an external pulse signal from the platter. You can create several markings underneath or at the outer face of the platter and strobe them. The electronic control unit can interpret this signal and will regulate the target value. This drive unit works only with 20 to 24 VDC. A special Power supply is included in delivery. The complete electronic control unit is integrated on board the drive unit. All diagnoses and updates can be done via internet. This high end drive unit is manufactured and assembled in Germany and conforms to RoHs standards and correlates with the European CE and the FCC in the United States. The Dereneville DAE-01 will only be produced in limited batches. The market price for this unique dedicated intelligent drive unit is: € 4.875,00 or US$ 5.500,00. Weiterführende Links zu "Dereneville Plattenspieler Antrieb DAE-01 SP"
Kundenbewertungen für "Dereneville Plattenspieler Antrieb DAE-01 SP"